With a full range of linear systems Myostat has a motion control solution that fits your needs. Ball screw actuators have enclosed recirculating ball bearings that travel on a threaded shaft with a helical raceway. The ball bearing design is able to accommodate heavy loads and deliver precise positioning. 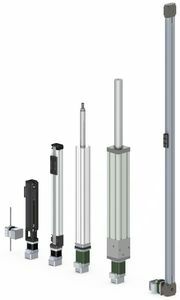 Ball screw actuators are the ideal mechanism for movement that requires smooth motion, efficiency, accuracy, and precision. Actuattors with lead screws are known for cost efficiencey and high accruacy. Lead screw systems can include anti-backlash nuts for reduced system play, with screws with teflon coatings to eliminate the need for lubricants. Typically lead screw systems have a wider variety of screw pitches which makes it easier for enigneers to find a 'best fit' speed and force range for their machines. Belt driven actuators are an excellent choice if a design requires speed and force. Using a grooved belt instead of a lead screw, these mechanisms are ideal for horizontal applications with the need for speed and longer strokes. Belt drives are often used when high linear speeds are required or when long strokes over 1m are needed. Belt drives are excellent choices for gantry systems, or as inexpensive alternatives to linear motors.